I see that as long as any kind of social transfer is involved rich women are as capable of “getting themselves pregnant” as teenage girls are claimed to be. Because conception is something that women and girls do to themselves, presumably by deliberately and irresponsibly walking through a cloud of anonymous, minding-its-own-business sperm somewhere. Apparently, these same women then gestate, sitting back and waiting for the spoils to come their way. How unfortunate that men can not avail themselves of the incredible opportunities presented by motherhood, like lower earnings capacity, increased job insecurity, drive-by judgementalism and diminished status. Note that in the election debate “the pretty little lady lawyer on the northshore is having a kid” (a sentiment I have seen expressed multiple times elsewhere during the campaign), and that the rich women in the meme, above, are “breeding”.. telling expressions.. because exactly where are the fathers in this condemnation? And why are children not part of our community, why are they not somebody whose interests we deem worthy of consideration in an election? I’m not a huge fan of Abbott’s paid parental leave scheme, (although I appreciate the progressiveness of treating maternity leave like other forms of workplace leave, I don’t believe the scheme is there to address a genuine policy problem and its funding is likely coming at the expense of funding opportunities for other big policy problems).. but I could do without the sexist claptrap in the discussion. Thanks for bring this up. “pretty little lady” was just about a throwing things at the TV moment for me. The whole things seems to be designed to bring out that sort of comment, honestly. And the meme of Abbott being inappropriate around women doesn’t help. The policy also makes me fear for the likely paternalism we’re going to see from Abbott and co. Quiggen’s post the other day about Abbott being a retro-liberal seemed all too plausible. Given the hairy way PPL is to be funded, it doesn’t give me much confidence that the rest of their tax’n’spend ideas will be particularly sensible. But no doubt it will be distinctly regressive. But I still hope we can avoid finding out. · n. Biology reproduction from an ovum without fertilization, especially in some invertebrates and lower plants. – DERIVATIVES parthenogenetic adj. parthenogenetically adv. – ORIGIN C19: mod. L., from Gk parthenos ‘virgin’ + genesis ‘creation’. Oh Megpie, I love that. and that the rich women in the meme, above, are “breeding”.. telling expressions.. because exactly where are the fathers in this condemnation? The criticism in the question (as I saw it) wasn’t about the “breeding” but about the taxpayers paying so much for it. And the parental leave payment is overwhelmingly going to go the mother. The baby bonus was (still is?) even explicitly only paid to the mother rather than being able to be shared between mother and father. There’s even a rather weird clause in Abbott’s parental leave scheme that if the father takes the parental leave he is paid at the mother’s salary rate rather than his own (I believe it is the mother’s not the *lower* rate of the couple, but I could be wrong on that). As for the scheme in general I think it would have been much better if it was fully funded through the tax on businesses. Which would much more cleanly categorise it as an employment condition similar to annual/long service leave rather than a welfare payment. Then you blame the poor men lured into a mire of grey eternal strife with your stealthy and crafty trickery, and sperm just floating around minding their own business. 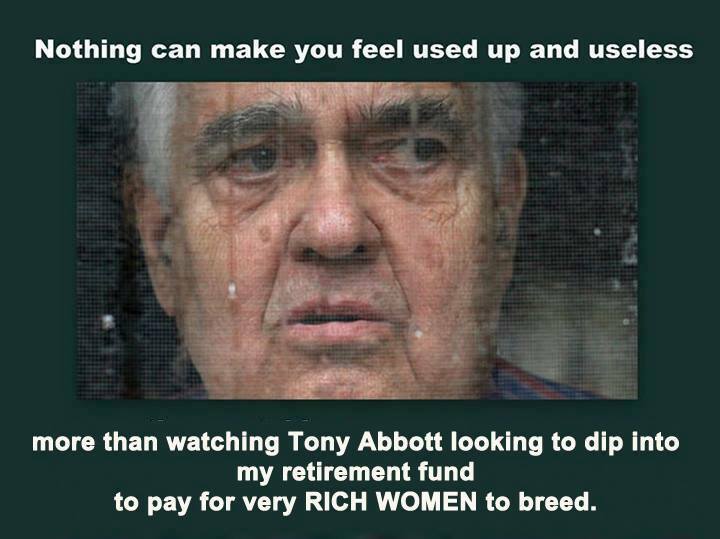 Now seriously, the Abbott scheme is only a wedge amongst women for the election. Women are lured back to the world of the bedroom and the kitchen for the offer of a little bling. As Chris says, it could/should have been in years ago, via social security or health. If Labor is wedged on this, some of it will be their own fault, they have become too much a stalking horse for the social conservative right and left themselves wide open with the clumsy announcement of cuts to single parents benefits a few months ago and this is why it seems an attack on social solidarity of this sort is now feasible. Dude… I could up my household income my $20,000, just(!) by having a baby – Awesome! Because conception is something that women and girls do to themselves, presumably by deliberately and irresponsibly walking through a cloud of anonymous, minding-its-own-business sperm somewhere. Just don’t anyone teach these clowns the word spermjacking. Chris – I think it is both. But the fact that criticism of a policy falls so quickly into criticism of women for having babies, particularly with this tone implying that it is some kind of rort women are carrying out, is very telling. I mean, women giving birth to babies and breastfeeding and bonding with infants is how we, as a mammal species, generally reproduce, and it doesn’t preclude men and other family members also being part of the rearing of small children. These are not women’s babies.. these are everyone’s babies. Wind your window up honey, there’s a spermcloud just past the lights, we’ll be driving through it shortly. I think I’d want to know about the spermcloud forecasts, even if only because of the washing. Could you prevent pregnancy that way by using a female condom? And lordy, it would make forensic scientist’s work so much harder, don’t you think?